Another vintage year for the veterans of Cornwall! The 2018 Cornwall Squash Masters’ Closed was held at Truro HQ on the weekend of the 24th/25th November. There was a good turn out from all corners of the county and a new category was added, the Over 65s, by popular request! Those who were crowned county champs: Dave Owen (St Ives) in the 65s; Dave ‘The Master’ Matthew (Truro) in the 60s; Mike Morgan (NQY) in the 55s; Tim Smith (Truro) won the 50s and 45s, and newcomer to the county Jamie Lang (NQY) won the 35s title in dramatic fashion V Launceston’s Phil Thomas in a spectacular 3-2 final in which both players had match ball. Indeed it was an epic battle and will go down as the most thrilling final in the Masters ever witnessed! 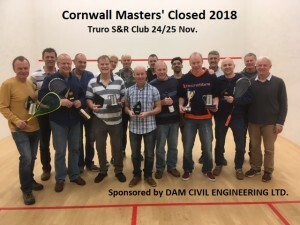 For more go to the EVENTS TAB and click on COUNTY MASTERS’ CLOSED……and see even more photos Facebook @ Cornwall Squash & Racketball! 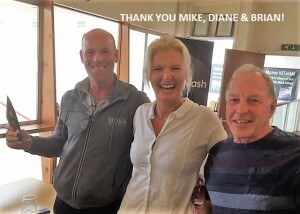 Sponsored by Diane and Mike – with thanks!